Full-time capital stewardship counsel leads to professional results. The probability of a successful campaign is greatly increased when guidance is placed in the skilled hands of an experienced consultant with years of experience in conducting Capital Stewardship Campaigns. You will find many more campaign success stories from churches that used outside counsel than those who did not. You will also find when checking references that churches, having used JDK&A, raised more money relative to their annual budget than those who used other firms. We help build a stronger sense of fellowship. Raising the needed funds is only one of the objectives in a properly directed campaign. Building a sense of community and engaging the congregation in working together, toward a common goal are equally important. Not only does a stewardship campaign increase appreciation and support for your church, but it increases community awareness as well. The JDK&A Campaign Plan calls for all church members to be included. Each member of the congregation will be treated equally. All will be given the opportunity to hear the plans of the campaign and prayerfully consider what all can contribute. A campaign requires broad participation and gifts ranging from large to small. Our professional consultants help ensure that the needs of your church are presented in the same manner to all church members. Full-time professional leadership is provided. Mission and ministries of the congregation identified. Necessity for the campaign is clearly stated. Plans and costs of the program are clear. Each family is contacted personally. “Equal sacrifice, not equal giving,” is the emphasis. Campaign is of short duration. Operates on a flat fee basis, agreed upon beforehand and confirmed by contract. Selects the best person available from our professional staff to serve as Campaign Director. Provides a Director who is a full-time, permanent member of our firm. Allows operational costs to remain under the control of our client. Submits a comprehensive Campaign Kit at conclusion of the campaign. Provides a thorough Follow-up Plan outlining steps to take during the pledging period. Maintains long-term relationship with client through continued follow up. The Campaign Director is a full-time, on-site professional who resides in your community, becomes a worshipping member of your congregation, and is immediately available to manage all aspects of the capital-stewardship campaign. "Why should we consider a Readiness Assessment / Feasibility Study?" is a frequently asked question. Successful campaigns have shown it is a necessary step that enhances the churches capital stewardship potential. Annual Campaigns can be much more than the yearly effort to fund the budget. 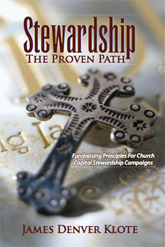 When conducted properly, it will focus your members on the Christian ideals, which promote a greater understanding of the role stewardship plays in their personal lives and a deeper commitment to individual stewardship. A greater awareness of the joy of giving is just one of the objectives brought to the campaign by the JDK&A Campaign Director. During this workshop attendees will be presented with the proven approach to enhancing their Annual Stewardship and Capital Stewardship Campaign. Our method of conducting campaigns has proven successful for over two decades. It is the goal of this workshop to assist church leaders in maintaining and enhancing their existing vital ministries and to help them understand how to fund new ministries if needed. The following is a questionnaire developed to help your church select the right consulting firm for your stewardship and fundraising campaign.